Updated June 2018 (scroll down for June 2018 reports: "Shining a Light" and "Debt Collectors:"
The mission of the Consumer Financial Protection Bureau (CFPB) is to identify dangerous and unfair financial practices, educate consumers about these practices, and regulate the financial institutions that perpetuate them. To help accomplish these goals, the CFPB has created the public Consumer Complaint Database. 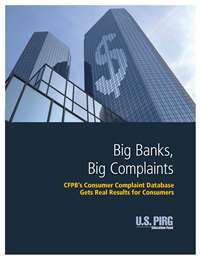 The database tracks complaints made by consumers to the CFPB and how they are resolved. It enables the CFPB to identify financial practices that threaten to harm consumers and enables the public to evaluate both the performance of the financial industry and of the CFPB. Our report series reviews complaints to the CFPB nationally and on a state-by-state level, with the aim of uncovering patterns in the problems consumers are experiencing with financial products and services. Numerous news outlets, including the Wall Street Journal, Huffington Post, and Today Money, have covered our research. This August 2016 blog entry offers a quick summary of recent improvements to the CFPB Complaint Database structure and its available information for consumers, researchers and competitors. Our latest reports (June 2018) respond to the threat that the public database may be eliminated by the current CFPB acting director. June 2018: Debt Collectors: CFPB Data Reveal Consumer Complaints By Company. U.S. PIRG Education Fund and Frontier Group examined a recent CFPB "snapshot" of debt collector complaints. We were disappointed it told us nothing about which were the the most-complained about debt collectors and what characteristics they had. So we did our own report, based on the public database. We remain very concerned that if the CFPB takes the database dark and only publishes weak, occasional reports of its own, that consumers and the marketplace will be the losers and corporate wrongdoers the winners. June 2018: Shining a Light On Consumer Problems: The Case for Public Access to the CFPB's Financial Complaints Database. The CFPB's Consumer Complaint Database has been public since it was established in 2012. Why take it dark? That would only aid corporate wrongdoers. U.S. PIRG and Frontier Group examine the many reasons that keeping the database public helps consumers, makes government more transparent to rsearchers, allows competitors to avoid practices that create complaints for others, and makes the marketplace work better. October 2017: Older Consumers in the Financial Marketplace: An Analysis of Complaints, and Results, From the CFPB. Congress created in the Consumer Bureau an Office of Older Americans, to look after these frequent targets of financial schemes. This report analyzed all complaints with a voluntary "older" tag (meaning complainant says age is >62). A two page summary fact sheet from the report is available. June 2017: Protecting Those Who Serve: How the CFPB Safeguards Military Members and Veterans from Abuse in the Financial Marketplace. Congress created in the CFPB an Office of Servicemember Affairs to ensure that servicemembers, veterans and their families had a watchdog against financial predators, including some that "line up like bears on a trout stream outside military bases." This report examines 44,000 complaints from servicemembers and also explains that the CFPB's work is doubly-critical because financial problems lead to revoked security clearances, which harms unit preparedness. A two page summary fact sheet from the report is available. April 2017: Medical Debt Malpractice: Consumer Complaints About Medical Debt Collectors, and How the CFPB Can Help. This report drills down into 17,701 medical debt collection complaints to the CFPB. Key finding: 63% of complaints were about debt never owed, debt no longer owed or discharged in bankruptcy, or never verified as belonging to that consumer. We also published a two-page fact sheet summarizing the report. December 2016: Big Banks, Big Overdraft Fees. This report combines data from the CFPB Consumer Complaint Database with additional data on big bank (>$1 Billion in assets) overdraft fee income required to be filed quarterly with the Federal Financial Institutions Examination Council (FFIEC). It finds a statistically valid correlation: banks that depend on overdraft fee revenue have more complaints to the CFPB. August 2016: Predatory Loans and Predatory Loan Complaints reviewed complaints about high-cost short-term small dollar (payday) loans and related high-cost installment loans using your paycheck as collateral, as well as similar loans using your auto title as collateral. The report also explains the history of payday lending regulation and analyzes a draft high-cost lending rule from the CFPB. July 2015: Mortgages and Mortgage Complaints reviewed complaints about mortgages and heralded the CFPB's recent (June 2015) inclusion, on a voluntary basis, of consumer narratives (stories) in the database going forward. February 2014: "Debt Collectors, Debt Complaints" reviewed complaints about debt collectors. Read more here. January 2014: "Credit Cards, Consumer Complaints" reviewed complaints about credit cards. Read more here. 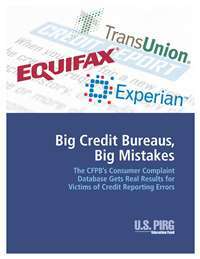 November 2013: "Big Credit Bureaus, Big Mistakes" reviewed complaints about credit reporting. Read more here. 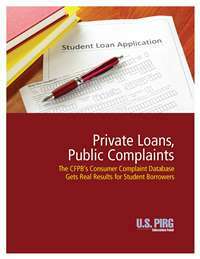 October 2013: "Private Loans, Public Complaints" reviewed complaints about private student loans. Read more here. September 2013: "Big Banks, Big Complaints" reviewed complaints aboutbank accounts and services. Read more here.